Ok, people, this is it, the day has come. Those long nights you’ve spent staring at your ceiling and cutting yourself while counting the hours, the minutes and the seconds left for Randal’s Monday to be released are finally over. 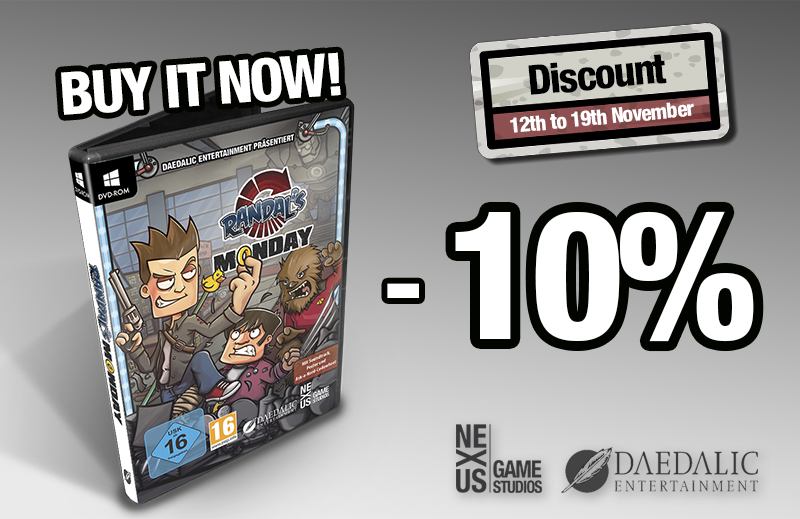 That day is today and it comes with a 10% discount (that will be available for one week after the day of release). So, if you’re looking for something different, funny and original, something that doesn’t take you for granted but that keeps working hard to surprise you every minute, and hundreds of different references from the ‘X Generation’, stop looking, ’cause you already found it, this game is for you. Just sit and enjoy this twisted story and its extravagant characters. Totally worth it. Not into downloading videogames? Are you one of those social outcasts that doesn’t know what Steam or GOG is? Have you tried downloading Randal’s Monday but you ended up filling out your tax return online? Don’t worry, we’ve thought of you and all those hipsters who’ve blackmailed us by saying they’d only buy the game if it came out in a physical version. We’ve got BIG news for all of you. The physical version of the game will be on sale on 8th December thanks to Meridiem and there’ll be two different editions. The limited edition box set will include the game, the manual, CD Sound Track and an A3 size poster. The price will be 29,99€. 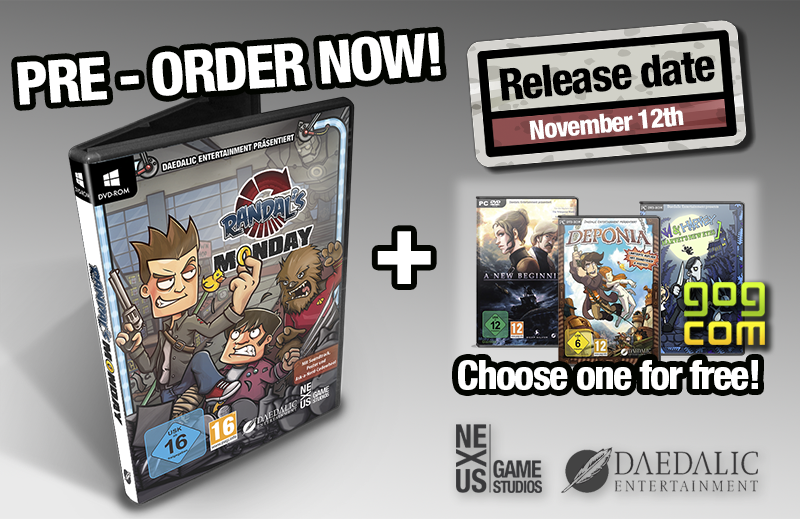 The standard edition, also available from 8th December, will include the game, the manual and CD Sound Track. This version will cost 24,99€. It’s been a long road, full of tears and caffeine but finally, we can proudly announce that Randal will start to sow chaos among the human race on November 12th, 2014, on both Steam and GOG. I know what you’re thinking so, don’t worry. There will be a version for PC and a version for MAC. ‘Cause you know, we don’t like unnecessary violence. 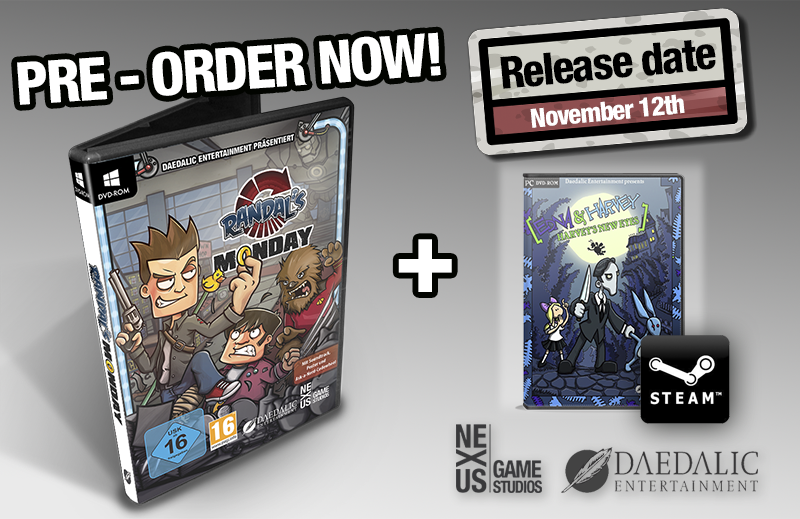 Randal’s Monday will be available for pre-order on Steam starting October 29th for $24.99. If you pre-order it on Steam, you will also get Daedalic Entertainment’s adventure game: ‘Edna & Harvey: The Breakout’ for free. If you prefer to purchase the game on GOG, the terms and dates will be exactly the same as on Steam with the exception that if you pre-order it at full price you will be able to pick a game among these three: ‘Edna & Harvey: The Breakout’, ‘Deponia’ or ‘A New Beginning’. So, now you know! If you can’t wait to enjoy Randal Hicks’s time-space odyssey go mark those dates on your calendar right now!! Remember, the pre-order starts on October 29th and the game will be released on November 12th. And spread the word, goddamnit!! 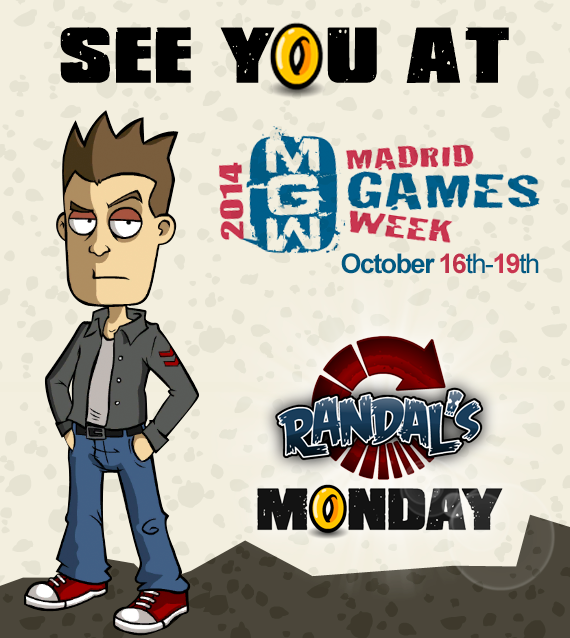 Remember that we will be attending the upcoming Madrid Games Week that will be held from October 16th-19th where we’ll be presenting Randal’s Monday to the public. You will also be able to try the game in the “Gamelab Academy area”. Also, don’t forget that we will be giving a talk about the degrading evolution Lars Von Trier films have experienced in the last years on October 18th (Saturday), and, well… if we have time, we’ll also talk a little bit about Randal’s Monday. And if we have a bunch of high quality voices for the Spanish version, the English one has no reason to be jealous! At this point, it’s no secret that Jeff Anderson (one of the main characters from the “Clerks” movies) has collaborated in Randal’s Monday by helping with the script and the dialogues. But of course he’s done more than that, as he also puts the voice for our main character. What better guy to play a sociopathic, kleptomaniac moron called Randal, than someone who’s done it before and in front of a camera? So, again, we couldn’t feel more honored. The release date is getting closer so, soon you’ll be able to experience all this yourselves… just a little more patience. 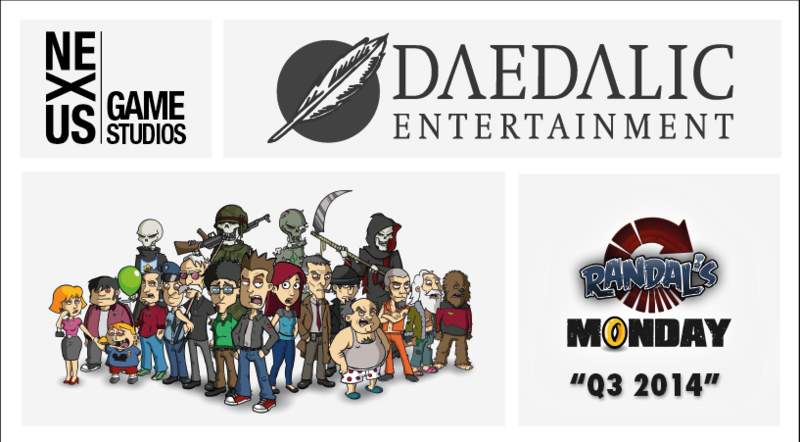 One more time, Randal’s Monday proudly attended Gamescom 2014 in Cologne –this time as a part of Daedalic’s team– and we had the privilege to share our space with other great projects such as “Silence”, “Fire” or “Blackguards 2” among others. (We were right next to “The Witcher 3”!!). Just like last year, it was a crazy experience! We had dozens and dozens of meetings and interviews with several different video games media. In fact, there were so many that we barely got to see the actual fair… which is a good thing!! We love to be able to show people our work, but we love it even more when those people (who don’t know us or owe us anything) give us a great feedback! It’s really fulfilling to see so many experts on the video games field laughing and enjoying Randal’s adventures. That feeling is priceless! 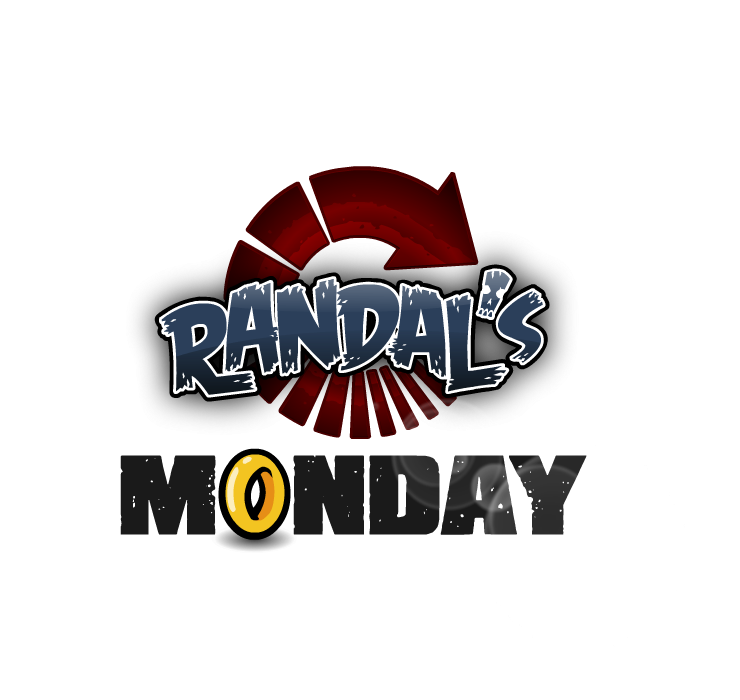 No matter what kind of player you are, just give Randal’s Monday a chance and you’ll feel like a kid in a candy store! Guaranteed! 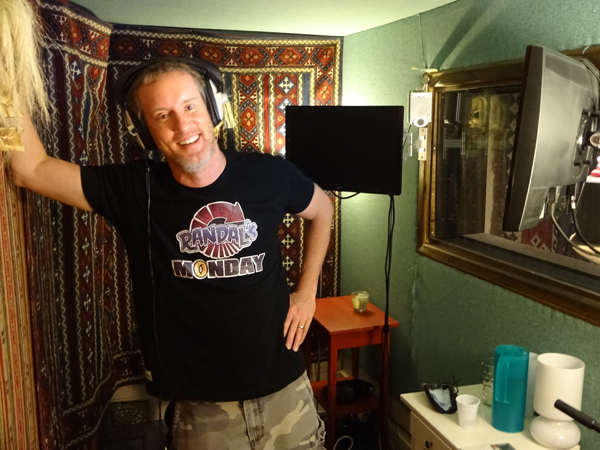 In case anyone wasn’t sure about the quality of the voices for the Spanish version of Randal’s Monday, get on your guard! We are very honored to announce that we’ve gathered a great cast of famous and well-known voices. People like Pepe Mediavilla (the actor who puts the voice for Morgan Freeman), Ramón Langa (Bruce Willis), David Robles (Leonardo Dicaprio and also Randal in “Clerks”) or Mar Bordallo (Penny in Big Bang Theory) are in this project, so that will result in some very sharp, charismatic and full of life characters. Their help will make sure that this little “micro-cosmos” we have created overflows with quality. Of course these are not the only talented actors we casted but… we are not gonna reveal them just yet… a little mystery is always nice… don’t you think? Ok… So finally we have enough news to make an update that’s actually relevant. First of all we want to say thank you for all the support you have shown since the very beginning. Bribes and beatings have given very good results so we’re all happy. On another note, it’s our honor to announce (again) that we have signed an international distribution agreement with Daedalic Entertainment. Yes, we know you know already, but we’re so thrilled we just rub it in all the time. Now that the project has become so big, we’ll have to reduce our hours of sleep to just three if we want to finish the game in time, but we are happy to. We are so excited with this opportunity. It is the best thing that could happen to us, well this, and Justin Bieber’s retirement of course. 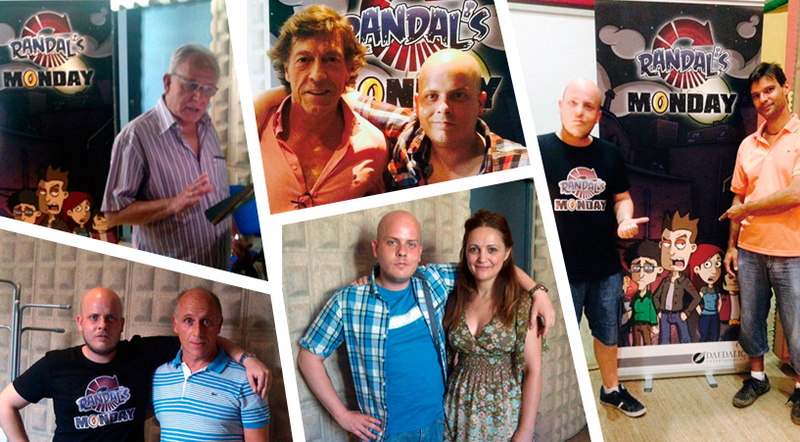 Randal’s Monday team attended Gamescom 2013, here you can read about the experience. GAMESCOM 2013… WE WOULDN’T MISS IT! It is confirmed, we will be present at this year’s Gamescom that will take place in Cologne, Germany, from 21st to 25th august. If you are planning to go as well, please don’t forget to visit our stand. You can find us in both, Entertainment and Business area. 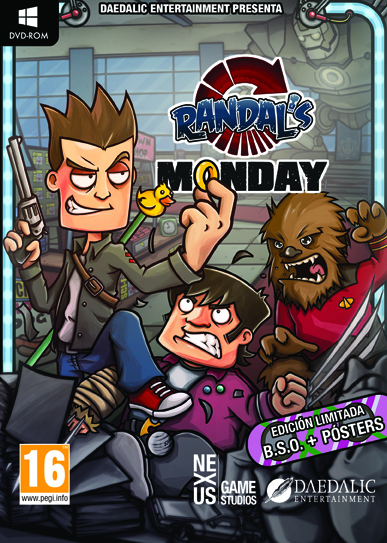 There you will find a playable demo for Randal’s Monday, plus, you can learn more about the game at first-hand. If you would like to make an appointment with us during the event please send an email to: info@randalsmonday.com.